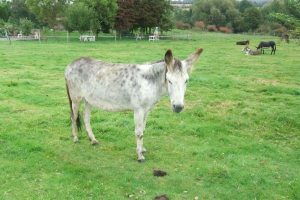 LAURA was born at the sanctuary in 1994. She is just a big baby, and has had to be separated from her mother, Penny, whenever possible because she refuses to acknowledge that she is grown-up now!She is very tall for a donkey and no-one can quite work out who her father might have been. Whoever he was, he must have had a very stubborn streak which he has passed on to Laura.